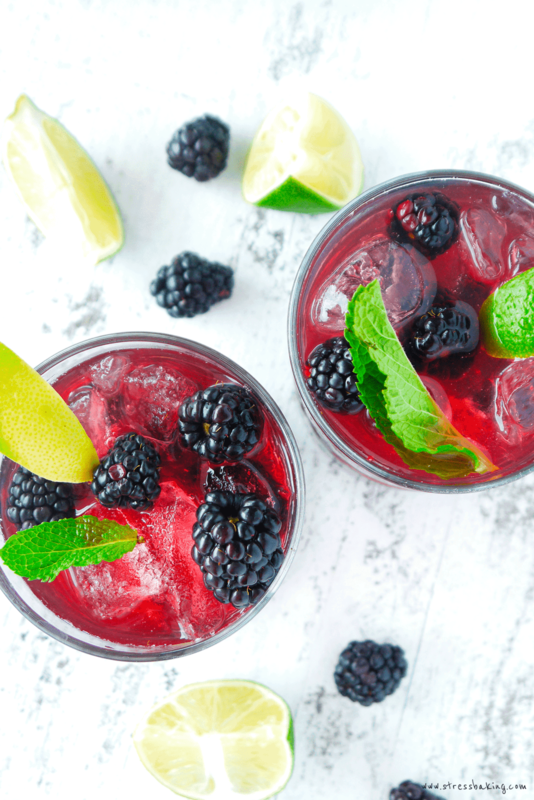 A fun and colorful spin on the classic mint julep – a touch of lime and homemade blackberry syrup gives it a fruity kick! The Kentucky Derby is Saturday, and while it’s never been an event that I really celebrated, per say, I always enjoy seeing people’s pictures from their Derby parties. Big hats, polka dot dresses, horse-themed e’rything, and – of course – mint juleps. You want the honest-to-god truth? I’ve never been a fan. I like bourbon when it’s mixed in drinks with other liquors and flavors, but I’ve never found myself reaching for a drink that features bourbon as the flavor taking center stage. Maybe it’s because I drank entirely too much whiskey in my 20s and the smell gives me a slight feeling of PTSD nostalgia. There’s a running joke at my office about one of our engineers who lives in the South. When he’s out of the office or needs to step away from his computer, we joke that he’s obviously just going to drink a mint julep in a fancy hat – with his pinky up, of course. It comes up in meetings, we’ve photoshopped him into dresses, he’s made gifs of it… it’s quite the production. Side note: He lives in Virginia, which some people don’t consider the South, or they feel it’s 50/50 depending on where in Virginia you’re talking… but since it’s south of Boston I’m just going to go with its literal placement on a map. End side note. Anyway, back to the Derby. I made a Kentucky Derby Pinterest board where I’ve been collecting a bunch of party ideas, recipes, and funny memes (because when it comes to memes, I can’t help myself) and it was making me a bit sad because people freaking love their mint juleps. I decided that since I hate not participating in the tradition of sipping mint juleps (pinkies up, of course), so I decided to put my own spin on it. And naturally, my spin was to liven it up a bit with a buncha fruit, and a little bit of sugar since blackberries are tart. If you find that your blackberries are sweet enough for you, feel free to reduce the amount of sugar you use in the syrup. I actually like it less sweet, so I tend to cut the amount in half when I do it – but as it’s written isn’t so sweet that it’s going to give you a toothache or turn this into fruity sangria. Don’t worry. This recipe isn’t complicated, but it does require a bit more planning than your typical julep. You need to make a blackberry syrup a little bit ahead of time (30 minutes, at least), and my personal preference is to use a shaker to really combine the blackberry and bourbon flavors. But if you’re a traditionalist, feel free to just muddle the mint leaves with the syrup and then pour in the bourbon – it’ll just be a stronger bourbon flavor. I don’t judge either way, because it’s still gonna be all purty. I mean, c’mon – look at that color! It’s so bright and vibrant, it would look fabulous next to a bright yellow dress and a giant navy blue hat. What? Just because I’m a food blogger doesn’t mean I can’t fantasize about pretty dresses and hats big enough to need their own seat on an airplane. I have Penny this weekend, and she’s pretty amenable to me doing ridiculous things to/around her… perhaps I can get her all fancy in a big hat and throw a sprig of mint in her water bowl. There’s no reason she can’t get in on the fun. Tell me how you’re going to celebrate the Kentucky Derby this weekend in the comments below! ? ? ? In a small saucepan, combine blackberries, sugar, water and lime and bring to a boil. Reduce heat and simmer, stirring occasionally while squishing the blackberries with the back of your spoon. Simmer until sauce has thickened, about 10 minutes. Let the strained sauce cool completely, at room temperature or in the fridge (to speed it up). If you cool it in the fridge, you’ll just need to give it a good stir to loosen it up before you add it to your drinks. Dividing evenly between two old fashioned glasses, pour your blackberry syrup into the bottom of each glass and top with mint leaves. Gently muddle the mint leaves, being careful not to rip them apart. Add bourbon and crushed ice, and gently stir to combine. 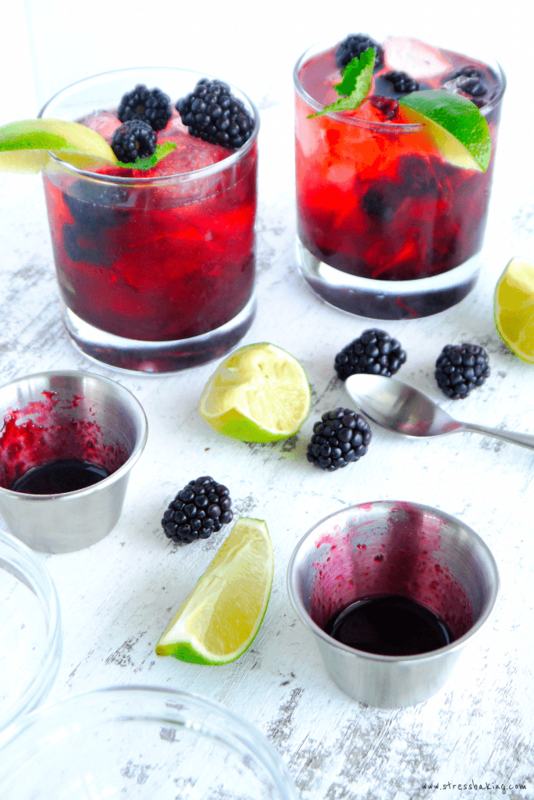 Add a squeeze of lime, a few blackberries, and garnish with mint leaves and a lime wedge. Dividing evenly between two old fashioned glasses, pour half of your blackberry syrup into the bottom of each glass and top with mint leaves. Gently muddle the mint leaves, being careful not to rip them apart. In a shaker, combine ice, the other half of your blackberry syrup, and bourbon and shake well to combine. 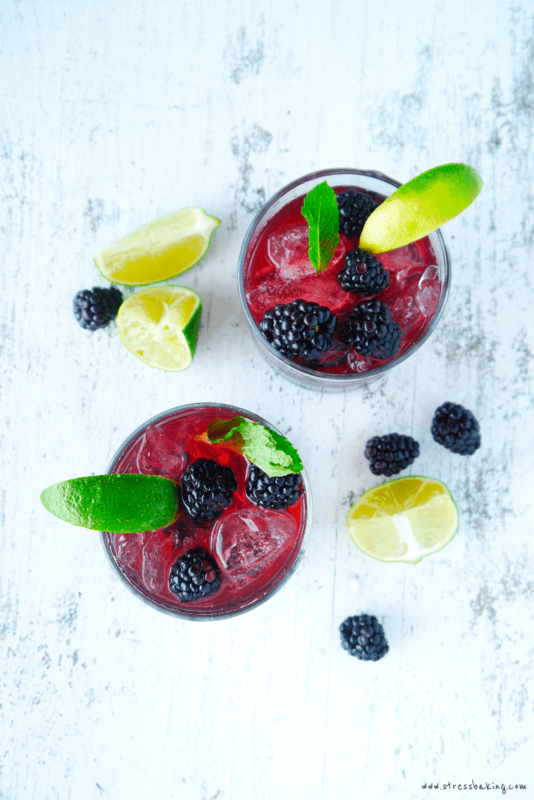 Divide evenly between your two glasses, add a squeeze of lime, a few blackberries, and garnish with mint leaves and a lime wedge. I wish I had blackberry bushes, that sounds amazing! Yum! Looks refreshing! I’m sure it tastes even better. This Julep is great for any occasion. The brightness of its color and its combination makes me want to sip and make it right at this moment. I am not a Derby fan either, but you are right. The hat, the dresses make me curious what is the fuss it is about. I think I would make a pitcher of this. The guests at the BBQ party could just help themselves. Love the flavours…and I know it would be a hit for sure. I love a good mint julep and your addition of the blackberries is perfect! I”m pinning this for later so I can make this at our annual Kentucky Derby party! 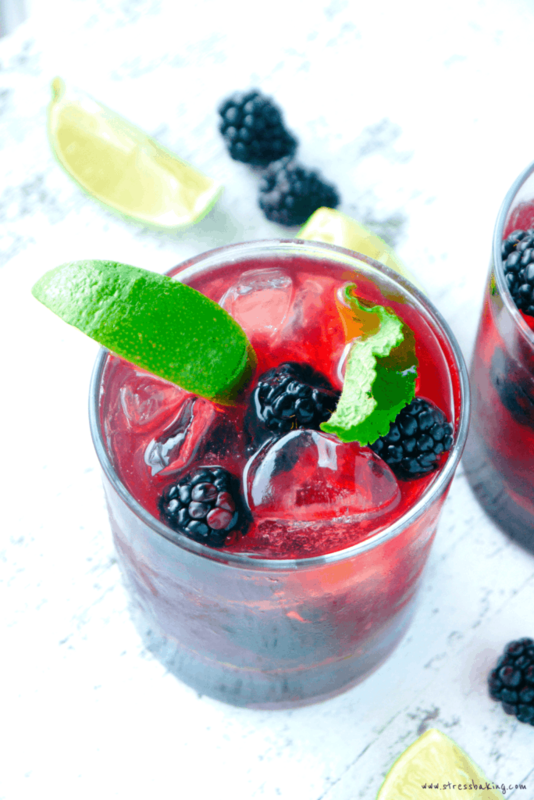 The color of your cocktail with the blackberries looks gorgeous! We’re bourbon fans, so can’t wait to try this. Nicely painted pictures of the derby and its fashion, poise pinkies up, lol. I have never had a mint julep but you fresh and crisp pictures have me intrigued especially on one of our hot days lazing in our backyard oasis. Well done! Love the PTSD……….. sorry nostalgia of it all! I’m all over this cocktail! Pass me the bourbon and berries please! It’s time for happy hour!!! All my favorite flavors! Blackberries, lime, and mint. I am pretty sure there is no way I’d be able to stop after just one of these. This sounds so refreshing! I have to make it before the Summer is over! Heck I will have to have it even when Summer is over! I miss having blackberry bushes in my yard, this drink sounds amazing! What a great use of blackberries! I could go for one of these juleps right after dinner tonight! Your photos are gorgeous by the way!